UTAR’s Public Relations (PR) students proved their mettle once again when they clinched two awards at the Immersion Project, Appreciation, and Tribute (IMPACT) 2017 award ceremony at Universiti Sains Malaysia (USM) on 14 December 2017. 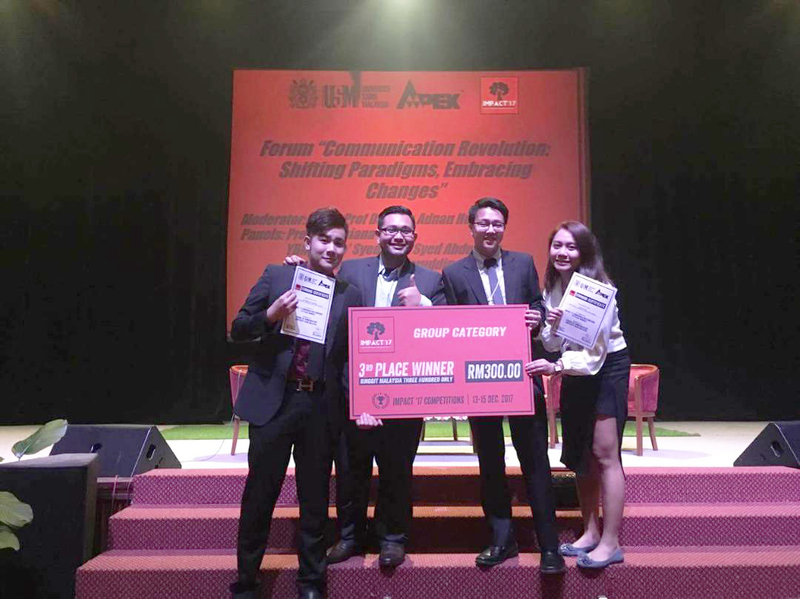 First year student Teh Chia Wei emerged as the winner of IMPACT 2017’s Short Video Competition while the 2016/2017 edition of PR Campaign, WOW Kampar, was the third place winner in the Best Communication Campaign category. Organised by USM’s School of Communication on an annual basis since 2008, IMPACT has since evolved into a platform for students of the communication and media studies from all over the nation and the ASEAN region to network, share knowledge and collaborate with one another. Currently in its ninth edition, IMPACT 2017 organised a series of competitions and activities such as feature writing, newspaper and magazine production, short video, photography, communication campaign, packaging design and public speaking which were open to communication and media studies students from Malaysia and the ASEAN region. Titled “A False Love”, Teh’s winning entry explores the theme of interracial love and its conflict. “My video was mainly about the love between a Chinese and a Malay Muslim. Love is blind. Therefore race, religion or age should never be the stopping factor for two individuals to fall in love with each other,” explained Teh, who was also elated to learn that his entry caught the judges’ attention despite the competitive entries from other foreign universities. To reflect that interracial relationship is real and common in our society, Teh filmed some scenes at SJK(C) Kampar Girls to show the commonality of different races studying in Chinese vernacular schools, a foundation where young Malaysians start to learn and live side by side with one another in harmony. Teh walked away with a cash prize of RM1,000 and also a certificate. “A False Love” can be viewed on YouTube. WOW Kampar, on the other hand, won a cash prize of RM300 and a certificate. Representing the group to receive the award were WOW Kampar Communication Department Executive Vice President Benjamin Lee Ee Heurn, Advertising and Promotion Division Senior Vice President Yeoh Weng Seong, and Sport and Recreation Division Senior Vice President Lok Jo Mien. They were accompanied by WOW Kampar Co-Advisor Muhamad Qamar Rahman Md Isa. 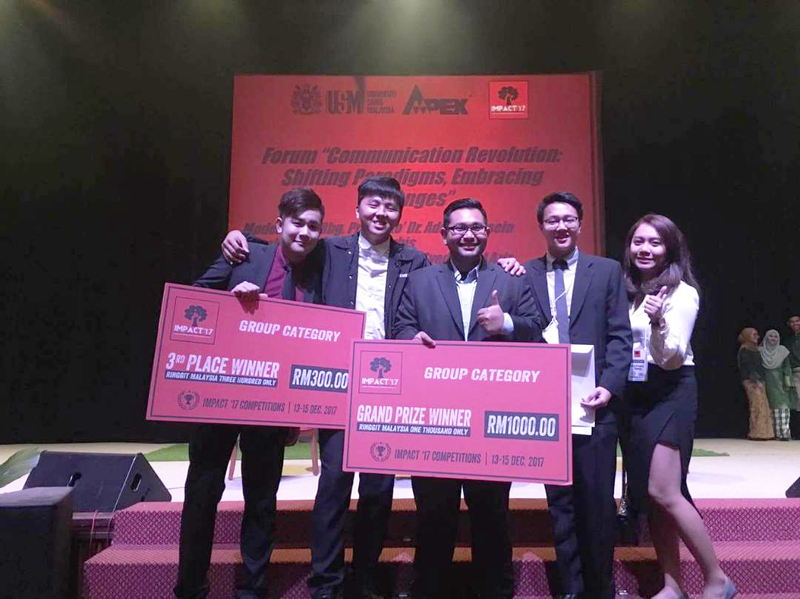 “To be able to compete among the many universities in the ASEAN region and emerge as one of best communication campaigns is indeed a recognition to WOW Kampar both locally and internationally. This award is dedicated to all the committee members who have worked tirelessly,” commented Lee. Thanking all the parties involved in making WOW Kampar a great success, he also expressed his pride that their achievements were able to highlight the excellence of UTAR and its PR programme. 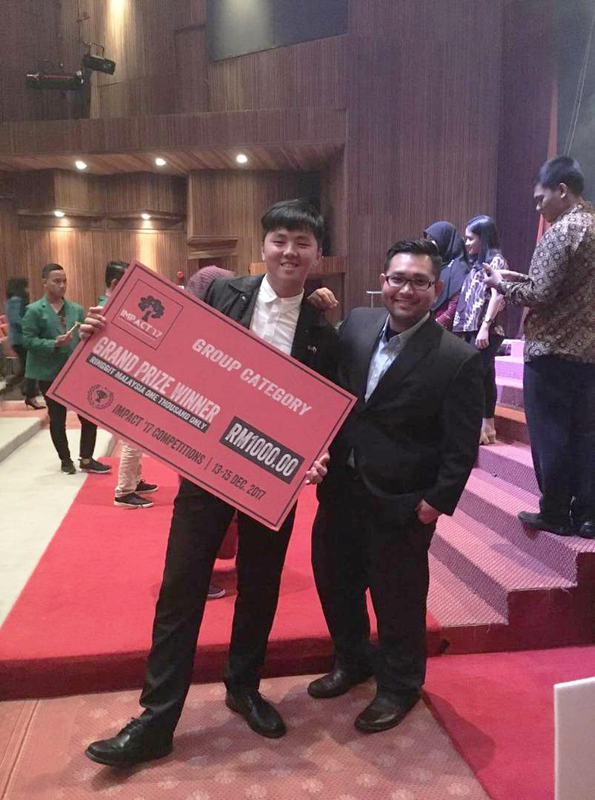 Echoing Lee’s sentiment, Qamar said, “This award is a testament that UTAR’s PR programme is effective. I am proud of all the 202 event planning and management students for their efforts in organising an event that stands out among the universities in the ASEAN region. It’s indeed a pleasure to be one of the advisors for WOW Kampar.” He also extended his appreciation to the Perak State Government, Ministry of Finance, Kampar District Council (MDKpr), Tourism Perak, Grand Kampar Hotel, event partners, media partners, sponsors and so on for the continuous support and commitment. Held from 24 to 26 March 2017, WOW Kampar was organised by a total of 202 UTAR PR students in collaboration with MDKpr in conjunction with Visit Perak Year 2017. The event also garnered the support of the Perak State Government and Tourism Perak. Previously, WOW Kampar also received the Anugerah Galakan Kecemerlangan Acara, an honour awarded by the Perak State Government as well as the Gold Award (“Institutions of Higher Learning – Students” category) in the Malaysia PR Awards (MPRA) 2016/2017 organised by the Public Relations Consultants’ Association of Malaysia.